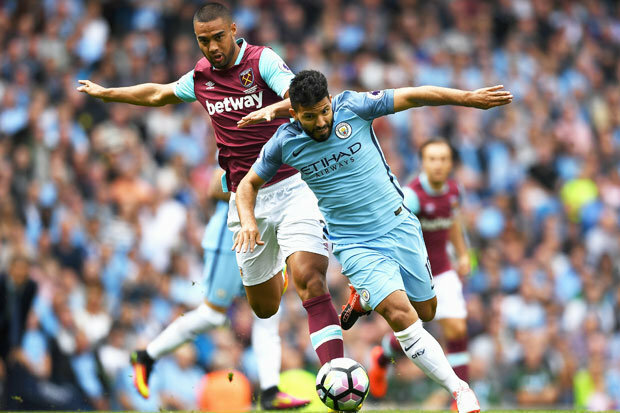 SERGIO AGUERO has been charged by the FA for violent conduct following his elbow on West Ham’s Winston Reid.The Argentinian forward is now set to miss Manchester City‘s next three domestic fixtures.The Manchester derby is the first game after the international break and Pep Guardiola’s side will have to play without their talisman. The incident with the New Zealand defender wasn’t seen by officials but was caught on video. City won the game 3-1 but the incident overshadowedGuardiola’s perfect start to the season.Aguero has until 6pm tomorrow to lodge an appeal against the charge. Aguero has had a great start to the season, scoring six goals in his four appearances in all competitions so far. As well as the clash with Jose Mourinho’s side, Aguero will miss the visit of Bournemouth and the EFL Cup tie with Swansea.